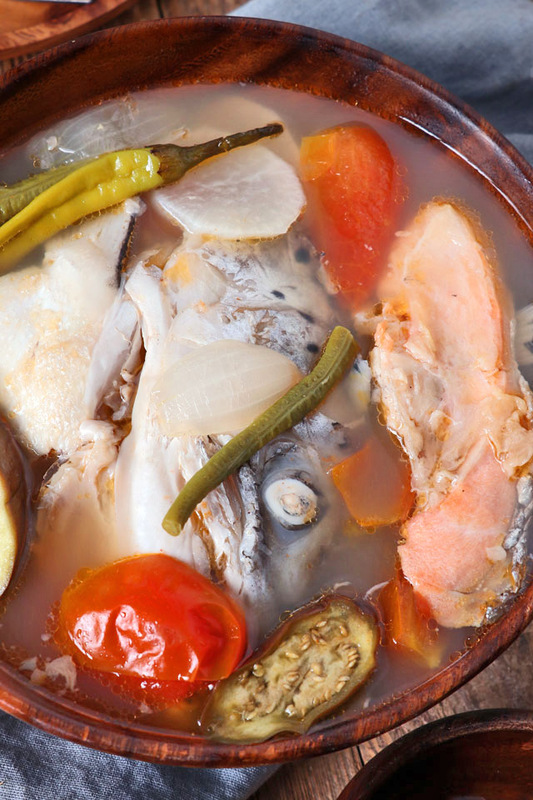 Stay warm and healthy while you enjoy this nutritious Sinigang na Salmon, a Filipino sour soup with a mix of fish and vegetables. 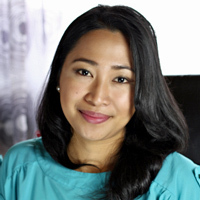 A few years back, Riza, a good friend of mine and also a Pinay, taught me a very valuable lesson. That is…salmon heads are stinking cheap in Germany and where to get them! Hahaha! 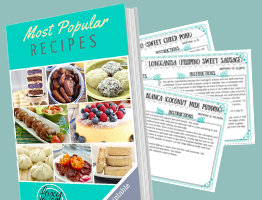 I know it sounded a bit melodramatic but practical tips like this one are goldmines when you are abroad and missing your favorite home dishes but do not know where to get the ingredients. Yes, it is true that I could just use the meaty part to cook but for some dishes, it is not entirely the same if it is not the same part, in this case , the head. And did I mention that it is very cheap? The locals never really found a use for the salmon heads, they usually discard and toss them away. So it is very unlikely that you’ll see salmon heads displayed in the groceries or fish markets. But if you ask nicely maybe you can get some. In Germany, ‘Wochenmarkt’ is a typical thing and are held in almost every city and major towns. It is a weekly market event where fresh local produce like fruits, vegetables, herbs, dairy, poultry, fish and meat and sometimes flowers and plants are being sold in various stalls and trucks. In our area, Überlingen (Bodensee), they do it twice a week. This is where Riza was able to buy the Salmon head. Riza tried it one day and asked the fish lady if she has Salmon heads, which she didn’t but kindly offered to bring her some on the next market day…and that was the beginning of many orders that followed as the word spread out to other Pinay friends, including yours truly. However, supply is limited as she only sells fresh ones and, of course, it will depend on how many salmon she was able to sell, so you have to order beforehand by going there on a market day and you get it (or maybe not) on the next one. 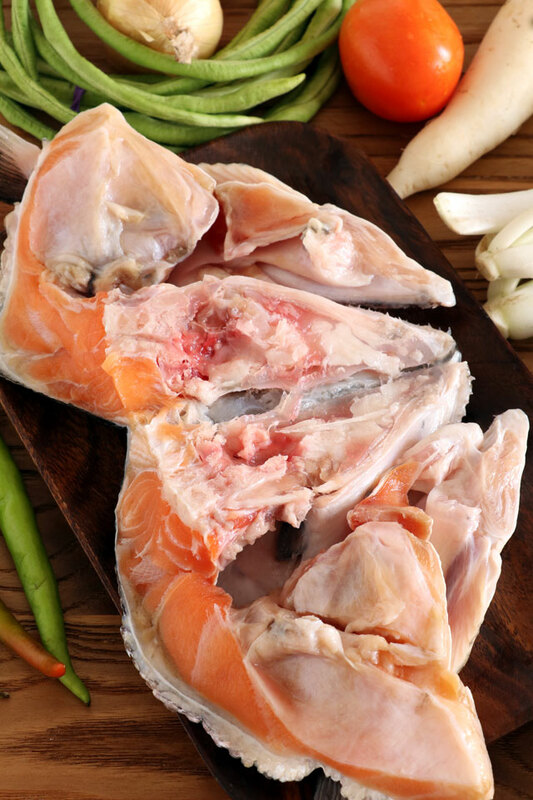 In the Philippines however, Salmon head is not spared from being cooked and eaten. What some people don’t know is that there is still plenty of meat to get from a salmon’s head and it also makes for a great soup. 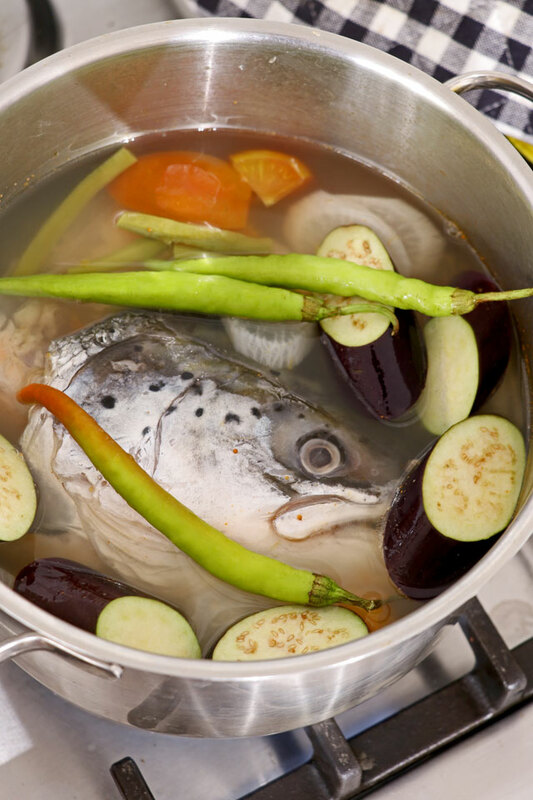 Here, one of the popular ways to cook salmon head is to make Sinigang na Salmon. Sinigang is a healthy soup combining some meat and vegetables and is popularly known for being sour by adding a souring agent to it. 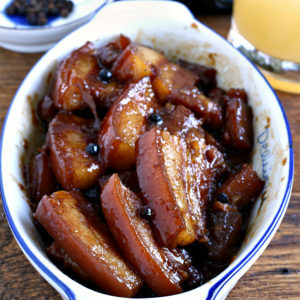 The most commonly used sour base is tamarind but other fruits can also be used, like guava, kamias, santol or whatever sour fruit (veggie) you can use. 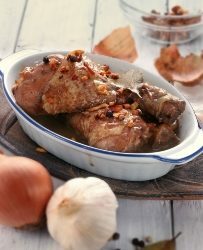 Other kinds of meats are also used to cook Sinigang, like pork, beef, chicken, shrimp, and fish. 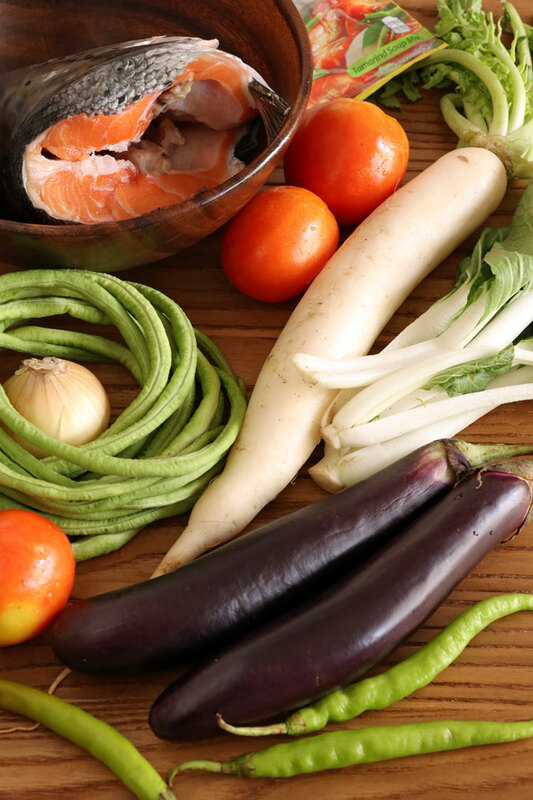 The common vegetables added to this delicious soup are tomatoes, white radish, long beans, okra, eggplant, taro, banana heart, and water spinach. You do not have to use all of this veggies together and it usually varies depending on the meat you are going to cook. Long green chili peppers are also usually added to add a kick and I love mine a bit spicier so I also crush the cooked chili in a small saucer and add fish sauce to it as a dipping sauce. Yum! 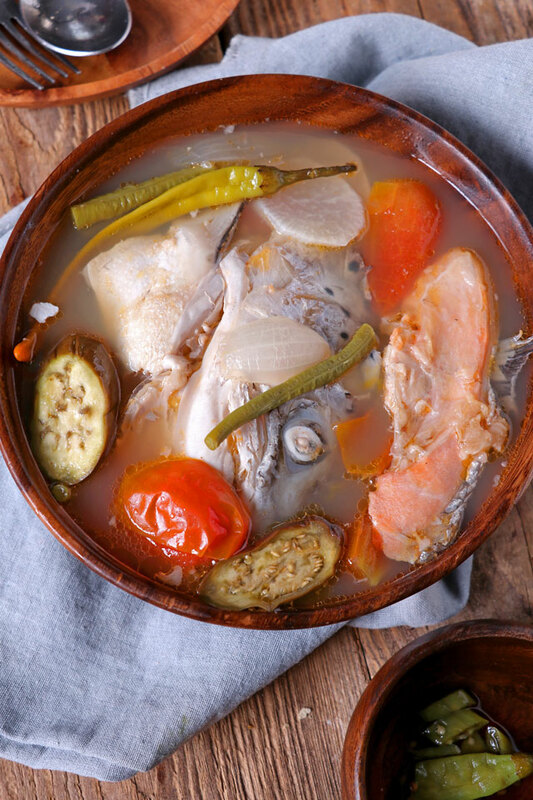 If you cannot get hold of some of the veggies in the recipe, as long as you have the sour base, tomatoes and one or two of the other vegetables, that is fine and can still enjoy this delectable Filipino dish of Sinigang na Salmon. 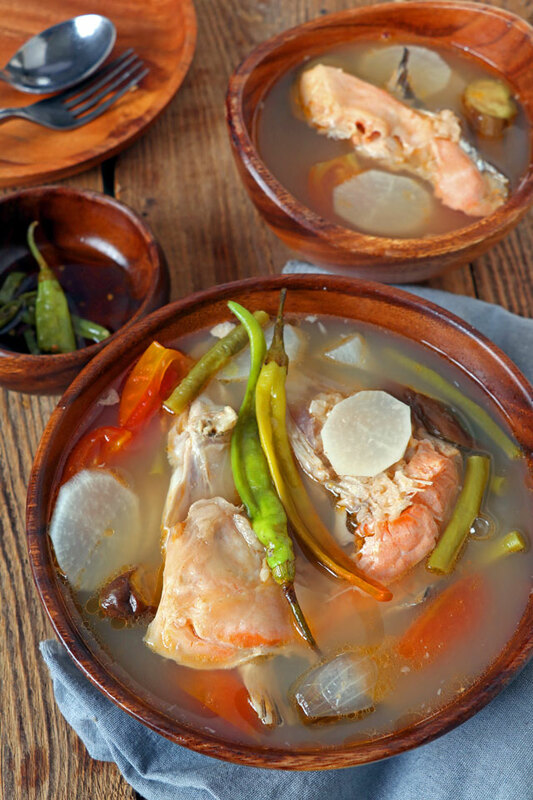 Stay warm and healthy while you enjoy this nutritious Sinigang na Salmon, a Filipino sour soup with a good mix of fish and vegetables. In a pot over high heat, bring 1 liter of water to boil. Add tomatoes, onion, ginger, yardlong beans, and white radish. Lower heat to medium and cover pot with lid. Simmer for 5 minutes or until white radish is just half cooked. Add the water spinach (Kangkong) and cook for a few seconds then turn off the heat. Transfer content to a serving soup dish and serve with steamed rice. I live in the UK and sometimes Morrisons supermarket sell salmon head and belly meant for the pets! But I buy they just the same for delicious sinigang. However, this is so rare. Marikina version does not have ginger. Just made your taho recipe using soy milk. It’s in the fridge right now, hope it would be as success. Hi Melita, I also usually skip the ginger but some people like to add it to remove or lessen the ‘lansa’ taste (which does not really bother me anyway, I believe that is a part of eating fish ?) but I find that if you use fresh fish, there should not be any. One of my favorite soup. We do the same here in the US. Our store just throw away their Salmon heads, so they give it to us for free. We got so many we can’t almost eat all of them. Aside from making Sinigang from the salmon head, we also make it as Inun-unan. Salmon head is always a treat for us.